The Modern Wood Shelving Unit by Sprout is a great addition to any living room, playroom or craft room. If you want to keep a room organized in style, the Modern Wood Shelving Unit by Sprout is the best option. 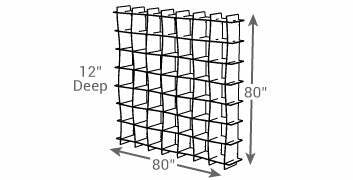 It has a unique wave design, and has more cubes per square foot than other storage unit options. Like our other cubby shelving units, the 49 cubby shelf is compatible with sprout decorative storage bins. When used together, you can store everything from books to office supplies, and electronics to baby toys. PS, all our furniture is made in the USA, eco-friendly, and all around awesome. Set includes: (1) Mid Century Bookcase, (1) Wall Anchoring Kit & (2) Tensioning Cords. Cube Dimensions: 10" x 10" x 10"